A catalyst is a substance which increases the rate of a reaction without being used up itself. They provide an alternative reaction route with a lower activation energy. A catalyst is a substance which increases the rate of a reaction without being used up itself. They do chemically change during the reaction, but not permanently. They can either lower the activation energy of the reaction or change the mechanism of the reaction completely. Catalysts can either be a transition metal, a transition metal oxide, or an enzyme. You need to know that the rate of a reaction depends on two main factors: the activation energy and the temperature. 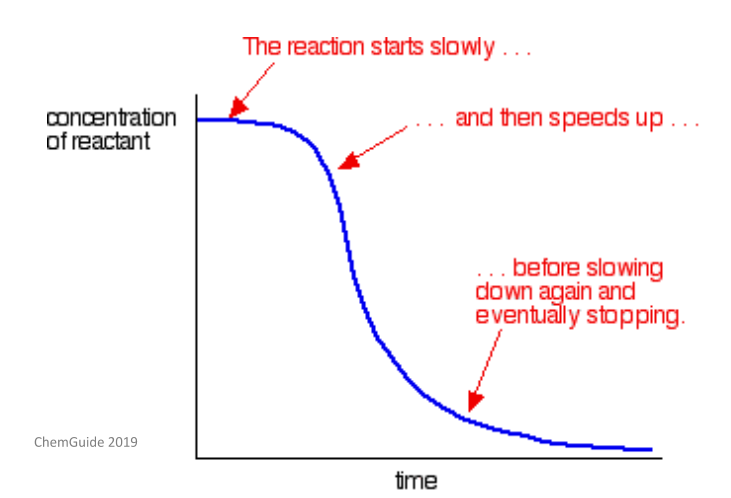 The activation energy of a reaction is the energy which needs to be provided in order for a chemical reaction to happen – this is measured in joules (J). 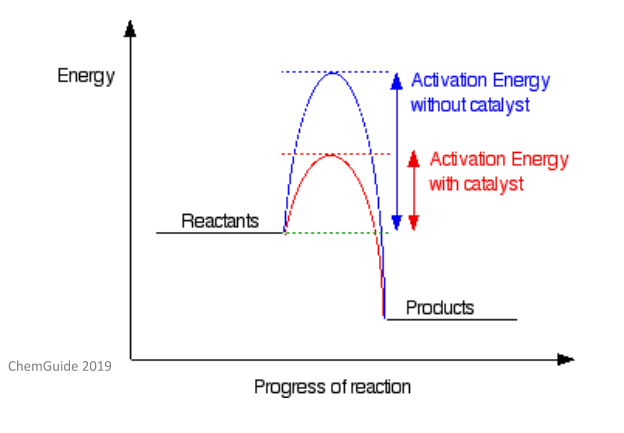 If a catalyst is added to a reaction, it can provide an alternative reaction mechanism with a lower activation energy. This lower activation energy means the reaction can proceed at a higher rate without the need to change the temperature or the concentrations of the reactants. As catalysts lower the activation energy, more molecules collide with the energy needed to reach a transition state. As you will see from the above diagram, the actual thermodynamics and end product of the reaction remains the same whether a catalyst is present or not. Catalysts react with one (or more) of the reactants to form an intermediate product. This then reacts to form the final product of the reaction, and therefore regenerating the catalyst in the process. As such, catalysts are not used up in a reaction. As catalysts are regenerated in a reaction, this means that you usually only need to add a small amount to increase the rate of a reaction. Catalysts can be split into two main types: heterogeneous and homogeneous. Heterogeneous catalysts are catalysts which exist in a different phase to the reactants. For example, a solid catalyst used in a reaction with liquids would be a heterogeneous catalyst – you can remember this by knowing that ‘hetero’ means ‘different’. Heterogenous catalysts work mainly through the same mechanism. One (or more) of the reactants is absorbed onto the surface of the catalyst at its active sites. Adsorption is not the same as absorption – adsorption is where the reactant molecule sticks to the surface of the catalysts, as opposed to absorption where the molecule is taken up. After adsorption has occurred, the reactants molecules and the catalyst interact, making the reactant molecules more reactive. The main reaction then occurs to form the product, which is then desorbed from the surface of the catalyst. This leaves the active site of the catalyst empty, which means more molecules can adsorb onto it and react. The below image shows an example of a heterogeneous catalyst reaction. For something to make a good heterogeneous catalyst, it must absorb the reactant molecules strongly enough for them to be able to react, but not too strongly so that the product can’t desorb. For example, platinum makes a good heterogenous catalyst because the reactants can adsorb easily, but the product can break away easily. Catalysts of this type are often in a fine powder form. This helps to maximise the surface area, and thus give the most efficient rate of reaction. This type of catalyst can also be separated very easily from the reaction mixture, which means expensive catalysts can be recovered and reused. Homogeneous catalysts exist in the same phase as the reactants, usually in a solution. For example, a liquid catalyst used in a reaction where the reactants are also liquids, the catalysts will be homogenous – you can remember this by knowing that ‘homo’ means ‘same’. Catalysis in this form is due to temporary changes in the oxidation state (and ligands) of a transition metal – this forms what is known as a catalytic cycle. Put more simply, the reactions happen through an intermediate species and the catalyst is reformed in the process. Homogeneous catalysts can ‘mix in’ with the reactants which means the degree of interaction between the catalysts and the reactant molecules will be very high. However, this also means that the catalysts usually cannot be recovered after the reaction is complete. There is an additional type of catalysis called autocatalysis. This is a reaction which is catalysed by one of the products of the reaction. In this type of reaction, as the catalyst is formed, the rate of reaction will increase. It will keep getting faster as more of the catalyst is formed. Eventually, all the catalyst will be used up and the reaction rate will lower. This is explained well by the curve below. Put more simply, autocatalysis is a reaction which can accelerate itself. Enzymes are known as biological catalysts. They are proteins which increase the rate of a chemical reaction through their active site. They work in exactly the same way as other catalysts – that is, by providing an alternative route of reaction with a lower activation energy. This is vital in biological systems because reaction rates at room temperature and pressure are very low. They are also, like other catalysts, not consumed during the reaction and so can catalyse many times. Unlike other catalysts, enzymes can usually only catalyse one type of reaction and are regulated by the concentration of the substrate.